Begin by mincing the garlic cloves for the meatballs. Garlic is a key ingredient and some people like it finely minced, while others like it a little more course. You decide according to your taste. 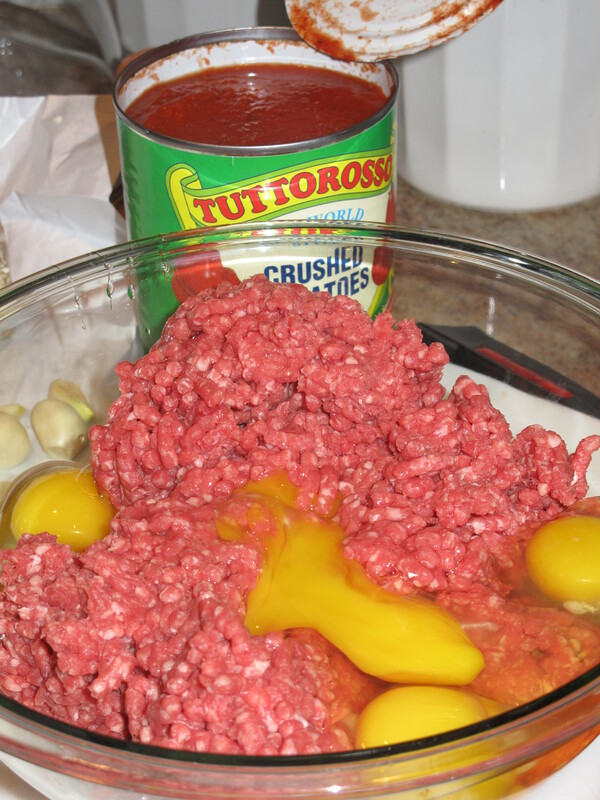 In a large bowl, add the ground sirloin and eggs. Crack eggs in a bowl one at a time to make sure they are good and don’t contain any shell and then add to the meat. Add the chopped Italian parsley, bread crumbs, grated cheese, milk and salt and pepper to meat and egg mixture. Now get your hands in there and mix all ingredients until well combined. Don’t mix too much after ingredients are combined as you want lighter meatballs and too much mixing will make them too heavy. Less is best. Insert fingers to the top of your rings. 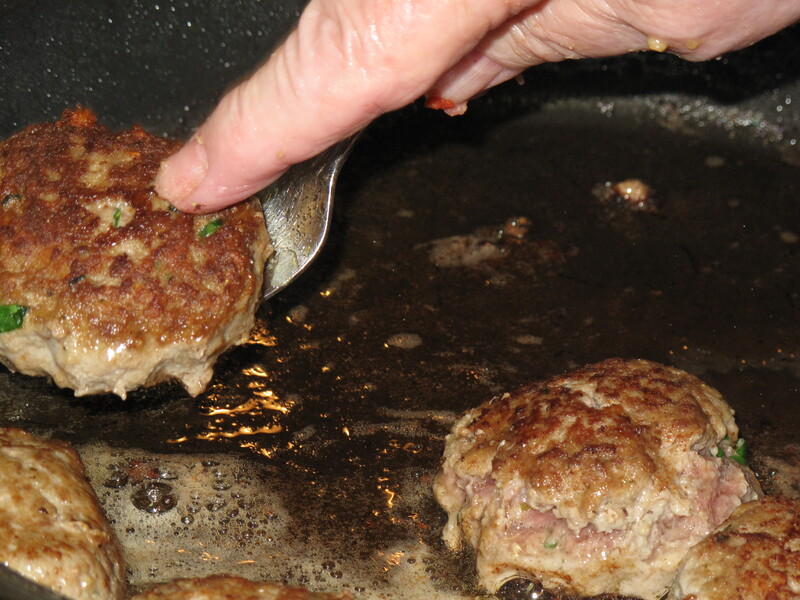 After the mixture is combined, heat the 1/4 cup olive oil from the sauce recipe in a large skillet. When it is heated, add the sausage pieces and brown them well. When the sausages are well browned, put them on a plate lined with paper towels to absorb the excess oil. In the sausage flavored olive oil, let’s start cooking the meatballs. 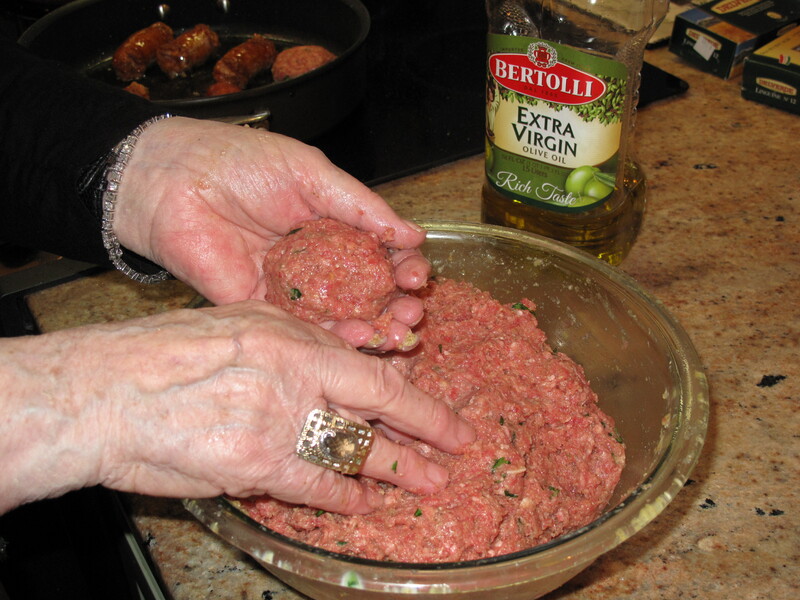 With your hands, take the meatball mixture and form a meatball into a size that fits in the palm of your hand. Have a bowl or glass of water nearby to dip your fingers into when you start to notice that the meat mixture is sticking to your fingers/palm. See a piece of parsley on the finger right above the ring, but nothing on the ring? 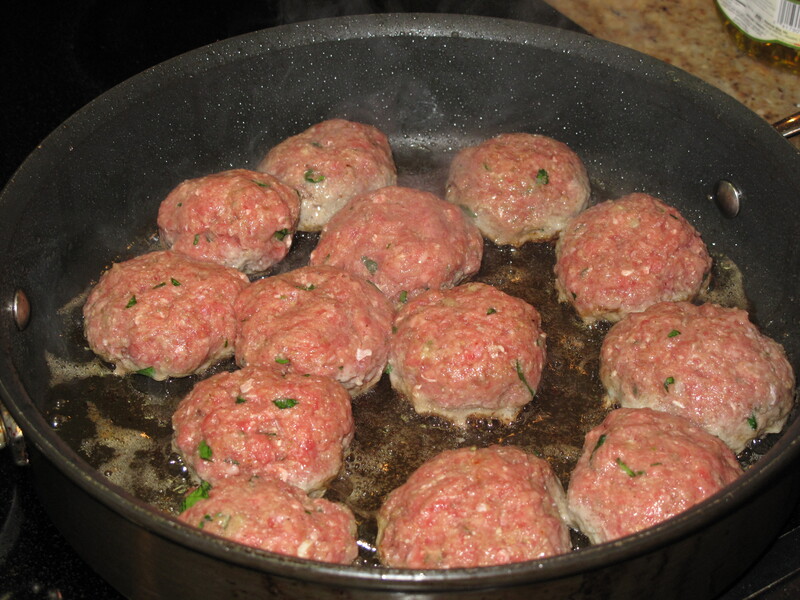 Add the meatballs to the oil and cook until well browned. 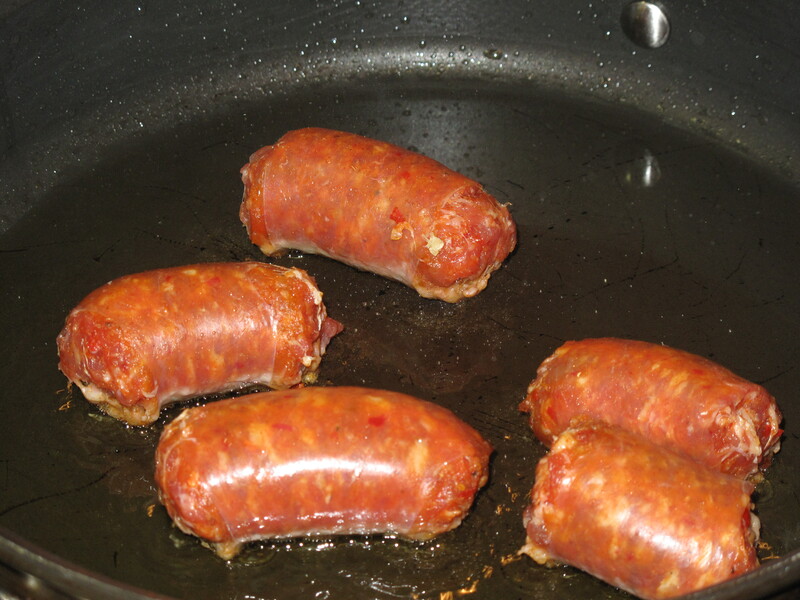 Remove them from the skillet and place them with the sausage on the plate lined with paper towels. Remember that they will continue to cook all the way through later in the process when they are added to the sauce. Now let’s move to completing the sauce. 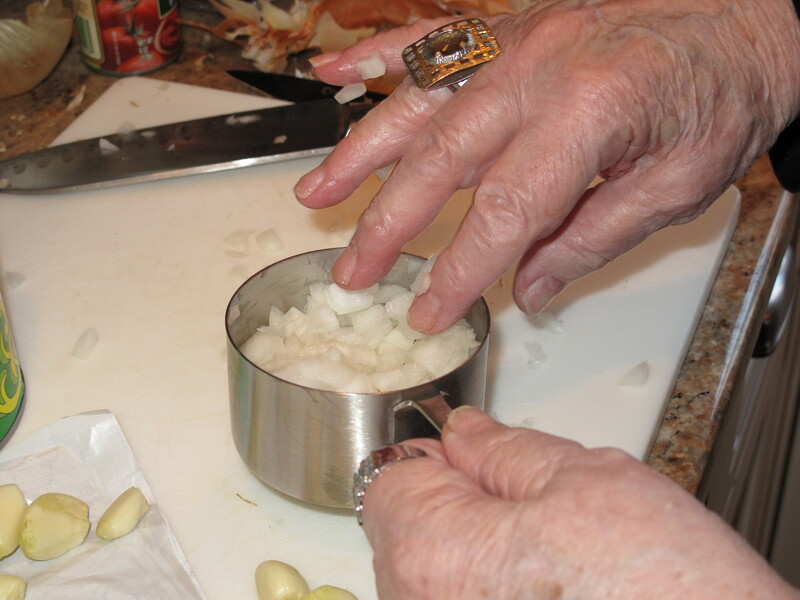 Begin by mincing the 6 other cloves of garlic and chopping the onions. Wearing a ring while chopping onions will not make you cry during the chopping process (not true)! Heat 3 tablespoons of olive oil in a large pot. When heated, add the garlic and onion and saute until onion is translucent. Add the tomato paste and cook until the paste gets very dark in color. At that time, add the two cans of crushed and plum tomatoes and stir to combine. Add salt and pepper to taste. Now add the sausage pieces and browned meatballs and simmer on the stove on medium to medium low heat for about an hour ensuring that the meatballs are cooked all the way through. Prepare the pasta of your choice (we used 2 pounds of linguine). Notice that the ring is clean and not caked with meat or sauce. Excellent execution! Add the torn basil leaves to the sauce and let them cook down into the sauce. 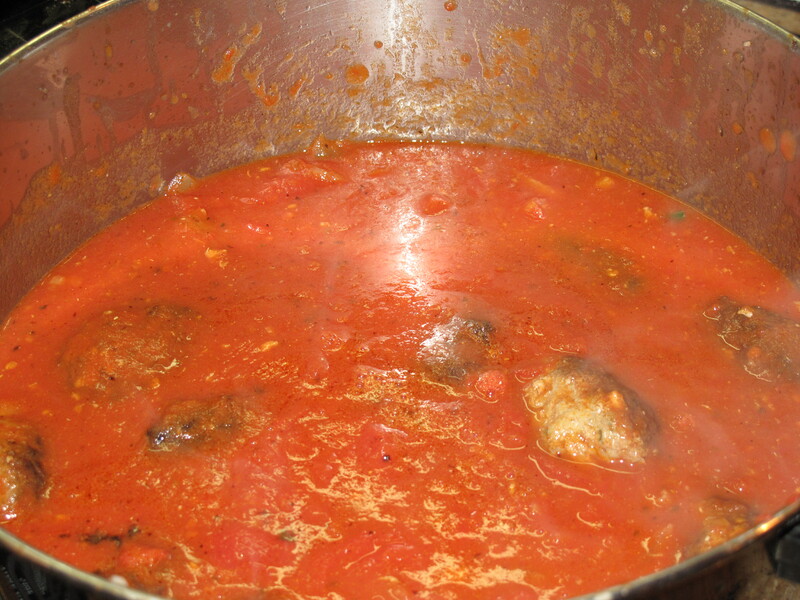 Ladle the sauce over the pasta and make sure to put lots of meatballs and sausage on top and enjoy. Grate more Pecorino over the top if you would like. How easy was that? Real Italian meatballs with gravy. Thanks to our Brooklyn Italian grandma. We will be bringing her back into the kitchen in the future. She makes more than meatballs and sauce. 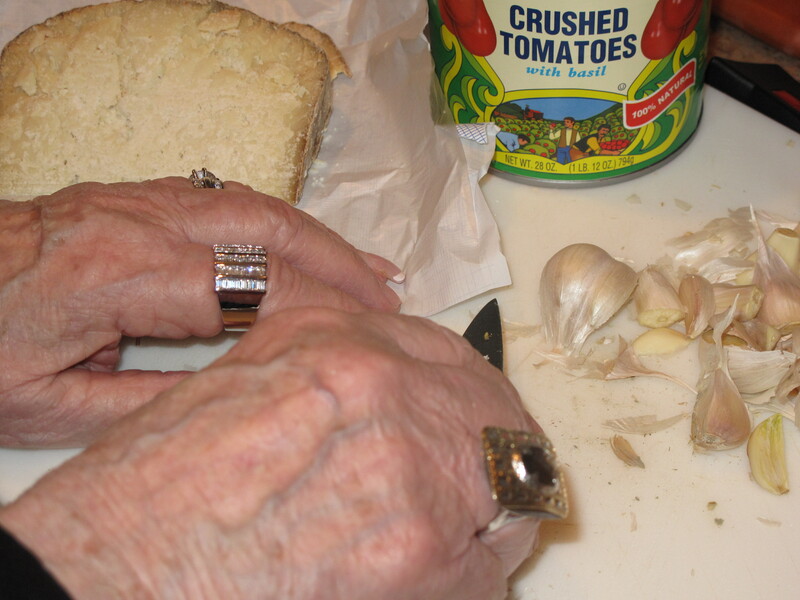 What Italian recipes would you like to see from our Brooklyn Italian grandma? This entry was posted in Food and tagged Food, Recipes. Bookmark the permalink. You should taste it. Delicious! Thanks for your comment Dianna. This really makes me hungry. Try the recipe Carolkin. It’s easy and delicious. Thanks for the comment. I have always wanted a recipe for meatballs and sauce from an authentic source. Now I have one complete with pictures and instructions for keeping your hands fashionable during the whole process. Thanks! It tastes great. Make it and let us know what you think here on Acorns On Glen. Thanks for the comment Kmart! Come back soon. As far as other recipes we would like to see her make….what else is needed other than meatballs and sauce? Those two items, made by a Brooklyn Italian Grandma, are LIFE! Nothing else needed. This recipe sounds exactly like my moms gravy!! YUMO!! we looked forward to spaghetti dinners every Thurs. and Sundays! Can’t wait to try your recipe!! Thanks! Just made it! Awesome thank you! I’ve already made this!!!!! It’s how I make meatballs now!!!!! Huge hit with my family!!!! We made this yesterday. It was very good, but I think we will cut down on the garlic next time. 12 cloves is a lot of garlic ! We made this yesterday and it was very good. I think. Next time we will cut back on the garlic. 12 cloves is a lot of garlic ! Made me feel like I was back in time with my grandmother and mother. That’s how they made a good meat ball. And sauce.. and also the atmosphere. And I do make mine as they did . They were better if the sauce was maid with fresh from the garden tomatoes. Although I do think they had a little meatball in there rings. Can you tell me what size can of tomato paste you used? I want to thank you for posting this. Prior to reading this, I’ve never made a meatball that wasn’t too dense for my preference. I pretended that I was wearing jewelry and wow the meatballs were perfect! I rather enjoy reading your recipes – you’ve been the surprise find for 2016 (laughed quite a bit about your dread of going to Charleston). By the way…..one more note to add to my comment above…..you never said what size tomato paste to use. There are three different sizes in the supermarket! I had to guess which one I should grab. More than likely, by the way my sauce looks, I got the wrong size. Hi. Haven’t been online in quite a while. Smallest can they sell. So adorable! Love the photos! Can’t wait to try this! Thank you!!!!! I grew up with two very Italian friends. Loved getting invited for dinner, even though none of the adults could speak English. Two things I miss from those old days are their pasta faglliola(spelling, sorry) soup made with beans and pasta in a thick broth. Another is a somewhat thicker chicken broth with small pasta, served with fresh grated parmesan cheese. (that was my job to be able to eat there, I had to grate the cheese. Has the B.I.G every made her meatballs by adding pork (say 1lbs of pork to 2 lbs of beef)? Everything you provided is very similar to my Sicilian and Italian grandmothers and mother meatball recipes. Did you every noticed the longer the meat (meatballs, sausage, pork, beef) cooked in the gravy the better they each tasted? It gives the meats the time to absorb the gravy and the gravy the time to take the fat of the meat – is there a term for this beside HEAVEN? B. I .G. I wished & needed this so badly. But could never get it because everyone is gone who could give it to me ! That does not help if you have a Sicilian spouse who talks about what his family made, not that he dislikes my cooking. I am to please of course.YOUNG PEOPLE take note. Its all about,TRADITION.Dont let it go. Not sure how many exactly, but a lot. Let’s say 8 people easy. 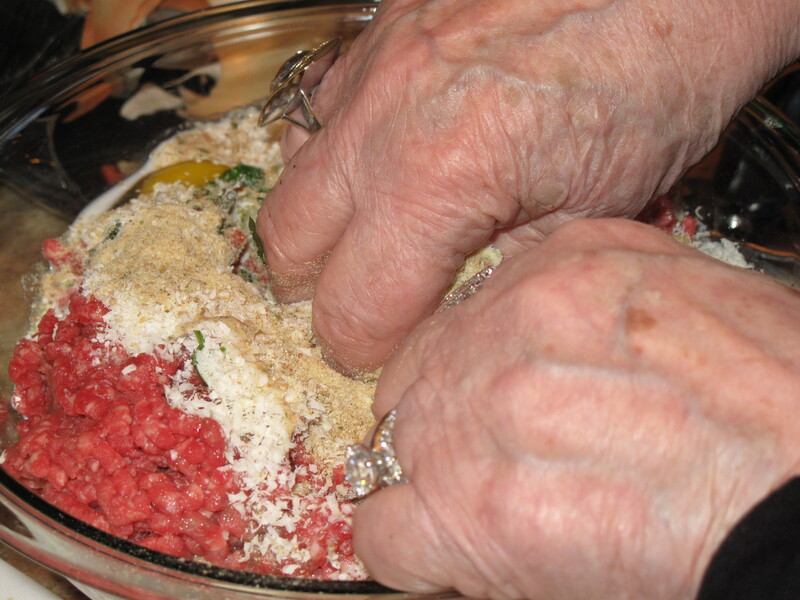 just seeing your nonna’s hands makes me cry. but, I’m gonna try your recipe simply for the wonderful memories the fotos brought me. Grazie dal cuore! 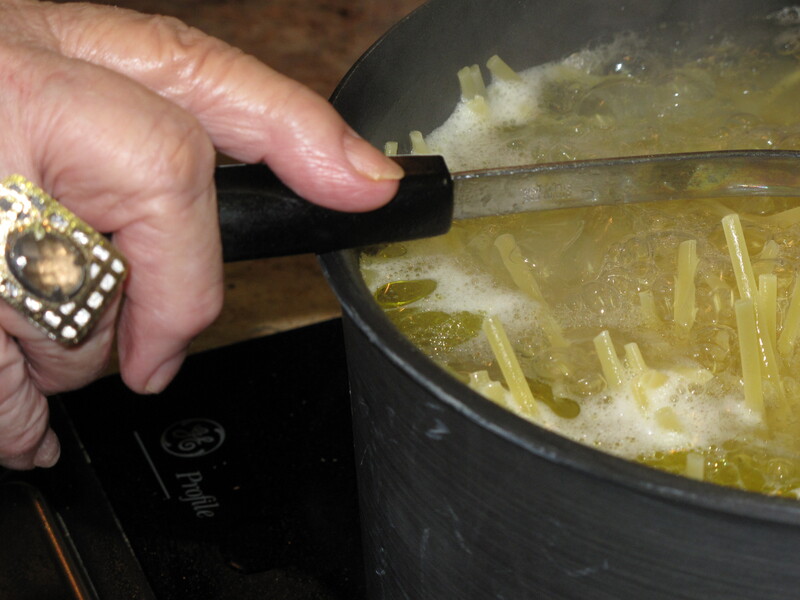 Try this addition to your meatballs….. An Italian trick. Add the soft white part of of Wonder bread soaked in milk and then wrung/squeezed out. Brings your meatballs to an elevated level! Amazingly moist & tender! This trick works wonders! yum-a-licious…just like my families. And called “gravy too”. I could eat some right now. Thank you from a californian transplanted from New Jersey. I ll have to try your grandmom’s recipe it really sounds yummy.. the ring was never affected as you said … unbelievable!! I finally have the perfect real recipe. I feel with the pictures and cute sayings about the ring showing the experience made me feel like I was in a kitchen watching a grandmother tell me how it’s done on a loving caring way to make sure I knew how to make and cook this right. I loved this. Thank you so much. This was perfect. Pasta e’ fagioli, and seafood marinara fra diavolo, linguini with sea food-white sauce. Thanks grandma’ will try your meatballs. I learned 50 years ago from a real Italian family and it’s quite different from this. LASAGNA what was the way B.I.G would make it? Did she make her own seasoned bread crumbs too? What did she use? Thanks your recipes are soon great. Amazing recipe, I follow this to the end and have never been disappointed! Love, love, love! yummie…this is how I make mine. Not from Brooklyn but from New Jersey. We call it Gravy. Either way it’s delicious.